A genuine fur handbag is a luxurious accessory that used to be reserved for the richest individuals. Now, these extravagant purses and handbags are making their way to the forefront of all modern fashion. The best outfits are only enhanced by this touch of class. Your fur handbag is one of the easiest ways to add an air of sophistication to an otherwise plain ensemble. 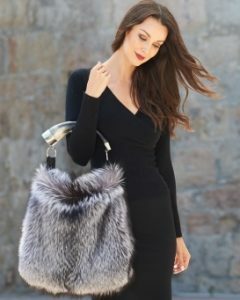 If you’ve been considering adding one of these sophisticated authentic fur handbags to your wardrobe, you should know how to take care of it. Caring for fur is crucial to making your items last. You should be fully committed to taking charge of the proper care and maintenance of your fur handbag before you ever make the first purchase. Take a look at some of these tips to help keep your purse in pristine condition. Did you ever envision that you may have to spend some time brushing your new handbag? This is an often forgotten maintenance tip that can help to preserve the quality of your fur over a long period of time. It takes only a few minutes but it can seriously extend the lifespan of your authentic fur purse. Purses can become especially matted and knotted rather quickly. They spend a lot of time enduring friction against your shirt, coat, or even a pair of jeans if you carry it low. The key to successfully maintaining a fur purse is to catch these knots and gnarls early on, before it requires vigorous yanking to untangle them. At least once per week, brush your purse using a tool specifically designed to brush fur, such as our Fur Wire Brush. You need to proceed with caution and comb knots gently. Vigorous and fast brushing can lead to bald patches as you pull out large chunks of the fur. These bald patches will be impossible to fix once the damage is done, so take care to do it properly and gently to begin with. Fur doesn’t mix well with water. Checking the weather forecast is going to be an essential part of your routine if you have a fur handbag. You can work to preserve the quality of the fur by changing out your handbag for stormy weather. A light drizzle may be fine for your fur, but a serious rainstorm or snowstorm could soak your bag. A handbag that’s dripping water isn’t likely to dry without the help of professional tools. If your fur handbag does get wet, you need to follow the right steps to help it dry out. Empty all of the items out of your purse and give it a good shake. This can help to get rid of excess water that may be on the surface of the fur before it penetrates through to the hide. Hang it up in an area that has great air circulation to see if it will be able to dry on its own. Whatever you do, do not take a hair dryer to your handbag or place it in the dryer. Exposure to excess heat can do damage to the hide underneath, causing it to dry out and release its grip on hair follicles. You may create large bald patches by exposing it to heat. The longer your handbag remains wet, the more likely it is to stretch out and lose its overall shape. If a full day has passed but the purse is still wet, contact a professional furrier immediately. They have the tools to examine the potential damage and dry it without ruining the integrity of the bag. We’ve already seen that authentic fur doesn’t handle moisture as well as other types of material. This can be especially crucial when it comes to the proper care of your handbag. Unlike fur coats and hats, a handbag has the potential to be exposed to significantly more spills and moisture than other items and accessories. Make an effort to examine any area before you set your purse down. This may be particularly applicable at a restaurant, where you may be tempted to set your purse on the table. However, icy glasses of water can leave condensation rings all over the table top that your fur purse shouldn’t absorb. Most individuals will prefer to place their fur handbag in their lap, if they set it down at all. You should never set a fur handbag on the ground. Dirt and bacteria are abundant on even the cleanest floor. A fur handbag is an expensive accessory, and you should ultimately treat it with the utmost care and attention. Fur is very susceptible to soaking up the oils and alcohols in common cosmetic items like makeup and perfume. A few dabs of makeup here and there will be relatively difficult to remove from the bag without the help of a professional furrier. However, it may be even more important for you to keep sprays away from your fur. Make sure to keep your purse in a different room before you spray hairspray or perfume. These popular items typically contain alcohol as a primary ingredient. Unfortunately, alcohol can dry out authentic furs or discolor the individual strands. You wouldn’t want to accidentally expose your favorite accessory to damage-causing chemicals found in these cosmetic items. If you’re in the habit of applying lotion, make sure that it soaks into the skin completely before you grab your purse. Lotion also has a number of harsh chemicals that can ruin the overall beauty and integrity of your fur. This may mean that you need to finish getting ready ten to fifteen minutes earlier than usual in order to preserve the quality of your fur handbag. You probably head to the salon at least a few times a year to touch up your highlights and trim your split ends. Similarly, you want to ensure that your fur handbag receives all of the attention and pampering it needs. A professional furrier should be hired at least once per year to do a routine cleaning of your handbag. Individuals lack the proper materials to wash a fur handbag at home. You should never place your beloved fur items in the washing machine or attempt to submerge them in water at home. Only a furrier is qualified to clean your items using a very specific method that doesn’t involve excess amounts of moisture. Be careful taking items to dry cleaners who may not be as experienced in fur maintenance. While your purse is at the furrier, talk to them about doing a glazing before you leave. This process can condition the fur and help to restore a little bit of the luster that is occasionally lost over time. Going to the furrier is a lot like making a salon appointment for your handbag. Handbags as a whole represent a large portion of American spending, accounting for $9.65 billion in 2017. A fur handbag is one of the most popular luxury items in this class and for good reason. An authentic fur handbag can make a serious fashion statement, but you have to know how to prolong its lifespan. They can require a hefty initial investment compared to other purses, but they are ultimately worth the price. Protect your investment and look more elegant by using these proper care and maintenance tips for your next handbag.